Details relating to the San Marino Commemorative of 2006. This coin commemorates the 500th anniversary of the death of Christopher Columbus, famous for his discovery of America. In the inner circle is a portrait of Columbus, looking to the right. Also to be seen are three ships with which he sailed across the Atlantic on his historic voyage of 1492 – the Niña, Pinta and Santa Maria. Just in from one o’clock is a compass rose referring to the sole means of navigation available then – it also resembles the sun and symbolizes the start of a new era which was opened by the discovery of the new world. Towards the bottom of the inner circle is a scroll with the dates 1506 and 2006 – the year of Columbus’s death and the year of issue respectively.. The mint mark “R” appears in from three o’clock, close to the centre of the coin. 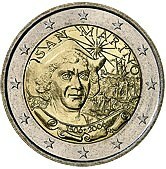 Return from San Marino Commemorative 2006 to euro coin collector.